One week after the I-Team and Telemundo 47 Investiga unveiled a black market that helps construction workers skirt safety requirements, there are calls for a crackdown. Stefan Holt reports. An undercover investigation by the NBC 4 New York I-Team and Telemundo 47 Investiga has found the black market sale of fake safety training cards for New York City construction workers is still booming, despite more than two dozen on-the-job deaths in the last few years and outreach by local officials. Workers on big projects are required by law to have 10 hours of training approved by the U.S. Occupational Safety & Health Administration (OSHA) – and carry a card certifying completion. The cost of training ranges from $150 to $300. But black market sales of fake cards have been a scourge of the industry, and an increasing priority for investigators as more than 30 workers have died in construction accidents in the past two years, records show. Mark Peters, commissioner of the New York City Department of Investigation (DOI), said his agency has looked into deaths on construction sites where workers had fake OSHA cards, and the findings were troublesome. An I-Team and Telemundo 47 Investiga joint investigation looks into how the black market for fake safety training cards are putting construction workers in danger. Pablo Gutierrez reports on how the city and government are dealing with the issue. "The fatalities were related to things that you would know to be careful of if you had proper safety training," Peters said. He described the fake cards as a real problem. "Workers aren’t getting the safety training that they need when they have these fake cards – and that’s really dangerous," Peters added. In some cases, workers get fake cards because they don't want to miss time on the job, according to Manhattan District Attorney Cy Vance. In other cases, Vance says employers don't want the workers to take the time off to get cards. "Many of these [workers] are non-English speaking. There is definitely a huge power differential between themselves and their employers,” Vance said. The I-Team and Telemundo 47 Investiga found it’s simple to get a fake card. After just a few minutes talking with fake ID dealers on Roosevelt Avenue in Jackson Heights, an undercover producer purchased one for $60. 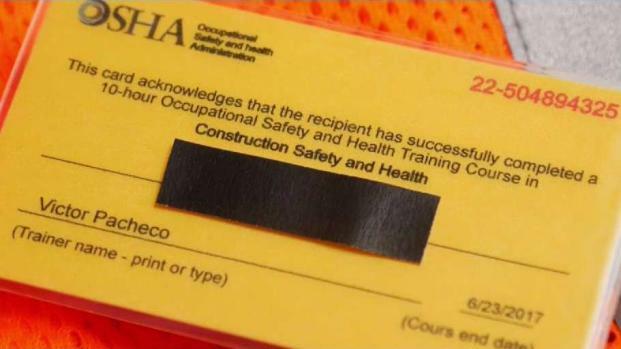 An undercover investigation by the NBC 4 New York I-Team and Telemundo 47 Investiga has found the black market sale of fake safety training cards for New York City construction workers is still booming, despite more than two dozen on-the-job deaths in the last few years. Pablo Gutierrez reports. 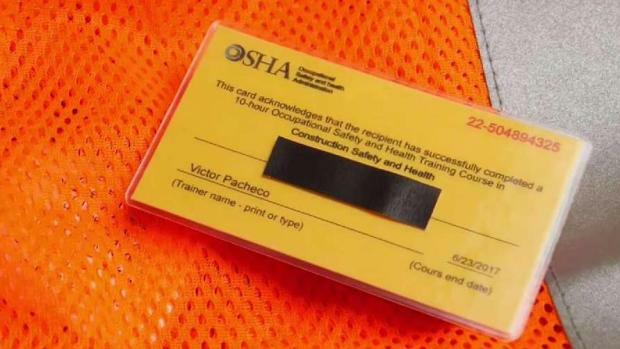 The name of a certified OSHA trainer – Victor Pacheco – was printed on the card. “This has been going on for seven or eight years,” Pacheco said, who’s been in the business for a decade and worked as an OSHA enforcement officer. “But it’s not only me. My boss, his name is being used on fake cards. People that work for me, their names are on fake cards. It’s all around." The DOI and Manhattan district attorney's office have fought back, at times arresting workers with fake cards and those selling them. But now, with the Manhattan Construction Task Force, they’re trying a new approach in cooperation with other agencies. “We have essentially said to workers, ‘Come in. Hand in your fake OSHA card. No questions asked,'" Peters said. "And we’ll take the card. We’ll give you the 10 hours of training. We’ll give it to you for free, and then you can have a legitimate card." The training is provided with local partners, including the Mexican consulate. In eight months, the program has taken 1,500 fake cards off the street. Despite the program’s success, Peters admits it’s an uphill battle. “Last week we confiscated cards from a construction site around the corner from our own offices. So yeah, while we’ve gotten a lot of cards off the street, there are probably thousands of fake cards still out there,” he said. 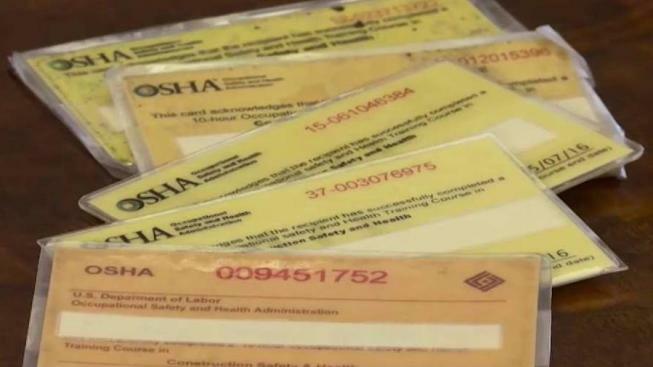 A big part of the problem, authorities say, is that OSHA cards have been on paper stock – and easily forged. That is changing. In a statement, OSHA said it’s “taken action to prevent or minimize [fake card] activity” with the introduction last year of plastic cards that include a QR code. Scanned information includes the worker’s name and details about their training. Workers in New York City must renew their safety training every five years, which means the paper cards will slowly become obsolete. On Friday, the city's political leaders responded to the report by NBC 4 New York I-Team and Telemundo 47 Investiga. Sen. Chuck Schumer said he'll work to maintain adequate funding and "beat back efforts to roll back worker safety standards" in the upcoming budget so that OSHA "has the resources to be the cop on the beat." "Construction work is inherently dangerous and certified safety training is essential to prevent injury and death," the senator said in a statement. A spokesperson for City Hall said, "No building is worth a person's life." The spokesperson said the city "is working with the City Council and stakeholders to strengthen training beyond the current OSHA-10 requirements, with measures to verify that workers have gotten the training they need to be safe on the job." The spokesperson also said City Hall will evaluate and incorporate improvements to the cards for any new training to prevent fraud, and that it will enhance enforcement to ensure developers and contractors are fulfilling their responsibilities to prevent worker injuries and deaths. Rep. Adriano Espaillat called the report "deeply concerning" in a statement, and said he'll take a closer look at the issue. "Cutting corners is not and cannot be acceptable and we must ensure workers have access to the required and vital training that OSHA provides – lives are at stake," he said. In a statement, Rep. Joe Crowley blamed Republicans in Congress, who he said "repeatedly starved [OSHA] and other federal labor law enforcement agencies of needed resources." The congressman said necessary investments need to be made in OSHA so inspectors can ensure work sites are safe, and that there needs to be improved security features on certification cards, or that a database needs to be developed to track them. "I hope OSHA and federal law enforcement agencies will crack down on this disturbing trend," Crowley said. To report unsafe working conditions, contact the Manhattan Construction Task Force via WhatsApp @ 646.712.0298 or call 311.